Benedictine Sisters Susan Nicole Reuber and Gayla Marie Aspromonte were recently received as novices into Our Lady of Grace Monastery in Beech Grove. They will enter a year of intense studies and integration of the monastic way of life. The sisters will begin what is called their canonical year as they meet the requirements set forth by canon law. Their time outside the monastery is limited as they continue their discernment of religious life. They will study the Rule of St. Benedict and take classes on monastic vows. Sister Susan Nicole was born in Evansville and is the daughter of Paul and Linda Reuber. She earned a bachelor’s degree in secondary education/English from Franklin College in Franklin and a master’s degree in education from Indiana Wesleyan University. Sister Susan Nicole taught at Switzerland County Middle School and, most recently, at Roncalli High School in Indianapolis. Sister Gayla Marie was born in Durango, Colo., and is the daughter of Sheila Ann Aspromonte and the late Dominic Aspromonte. She studied pre-pharmacy at Fort Lewis College in Colorado, and earned a bachelor of science degree in pharmacy from the University of Colorado. Prior to her entrance to Our Lady of Grace Monastery, Sister Gayla Marie worked as a hospital pharmacist. 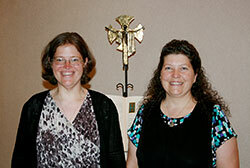 In addition to the two first-year novices, the Benedictine community at Our Lady of Grace Monastery has one sister in her second year as a novice and a sister in temporary vows.